Peter Hogness saw a spot of hope in Nevada in last year’s otherwise disastrous election. Donald Trump lost the state, and Democrats held on to a Senate seat and won control of the state legislature — for which he credits the work of the Culinary Union, UNITE HERE Local 226, which represents more than 55,000 hotel, casino and restaurant workers in the state, mostly women and immigrants. “What struck me was that the union played the role it did in expanding the electorate and the pool of activists,” he says. But Hogness, a longtime union staffer and labor journalist, was also well aware of the pitfalls of electoral politics, that the intensity and passion put behind a progressive candidate like Bernie Sanders or Jesse Jackson in the 1980s can “start sucking up all the oxygen” and dissipate after the election. The result was Water for the Grassroots, an organization founded in February to aid other groups doing “long-term organizing, but active at election time” — particularly those in states that are more likely than New York to elect right-wing politicians who can impose their agenda on the entire nation. This year, it assisted voter-registration, canvassing and get-out-the-vote efforts by grassroots groups in Philadelphia; drummed up support for a Florida ballot initiative that would restore the right to vote to 1.6 million people convicted of felonies other than murder or sexual assault; and raised money for Woke Vote, a black-led campus get-out-the-vote effort in Alabama’s Dec. 12 senatorial election. “We think these elections are important,” says Hogness, “but we also want to put our energy into groups that will be around for the long term.” The group has about 10 to 15 regular participants and 40 to 50 occasional ones, he says. 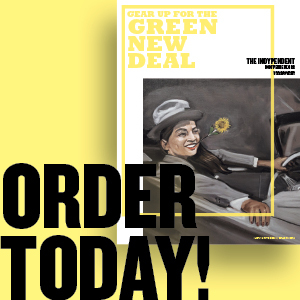 In Philadelphia, Water for the Grassroots volunteers went door to door in predominantly black North Philadelphia neighborhoods on behalf of Reclaim Philadelphia and the BLOC Party. Reclaim Philadelphia’s main issues include economic equality, criminal justice reform and education, while the BLOC Party seeks to end mass incarceration and “create a voters’ bloc” uniting the city’s more than 300,000 formerly incarcerated people with community activists and neighborhood residents, says cofounder Jondhi Harrell. It’s also trying to stop a natural gas plant slated for the Nicetown-Tioga neighborhood. “It was really inspiring to know that people from New York City wanted to come down and help,” says Rich Krajewski of Reclaim Philadelphia. The groups’ electoral efforts were part of their backing of Larry Krasner, who was elected district attorney in November on a platform of changing the office’s culture from one “of seeking victory for prosecutors” to one of achieving “real justice for victims and others caught up in the criminal justice system.” Water for the Grassroots volunteers were part of an effort that “knocked on 60,000 doors,” says Harrell. Orange, New Jersey City Council president Donna K. Williams, who joined Water for the Grassroots for one weekend of door-to-door canvassing in Philadelphia, had similar experiences. People who initially objected to registering to vote — “I did have people say, ‘I don’t believe in that,’” she says — were more open once she explained what Krasner’s policies would be. 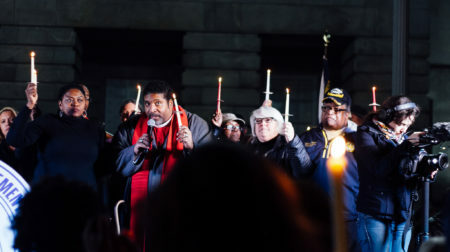 Water for the Grassroots is also likely to work with Lancaster Stands Up, a group born out of an emergency meeting after the election attended by more than 300 people in this city of 60,000 in south-central Pennsylvania, says organizer Michelle Hines. Health care and immigration have been two main issues; the city is now 40 percent Latino and home to many Syrian and Palestinian refugees. It staged a sit-in in May at Rep. Lloyd Smucker’s office to protest his support for repealing Obamacare, and raised money to defend Osman Aroche Enriquez, a 27-year-old Guatemalan seized by immigration authorities after his application to renew his stay and work here under the Deferred Action for Childhood Arrivals program was one of the thousands that missed the deadline because the Postal Service took several weeks to deliver them. But the group is becoming more involved in electoral work. Some politicians just can’t be persuaded and need to be voted out, says Hines. Lancaster Stands Up is now taking questionnaires from the three candidates running in the April Democratic primary. Unseating Smucker will be an uphill battle. The rural areas outside Lancaster are heavily Republican, and Pennsylvania’s congressional districts vie with Texas for the most GOP-gerrymandered in the nation. Still, Smucker won his first term in 2016 with only 52 percent of the vote. To win, she says, they’ll need to register more than 15,000 new voters. “The potential to have 12 volunteers come down will be really helpful,” she says. One project Water for the Grassroots originally envisioned is on the back burner for now: being a “matchmaking service” to connect low-budget community organizing groups that can’t afford to pay for professional-quality video and graphic design with media workers who have those skills and want to volunteer. 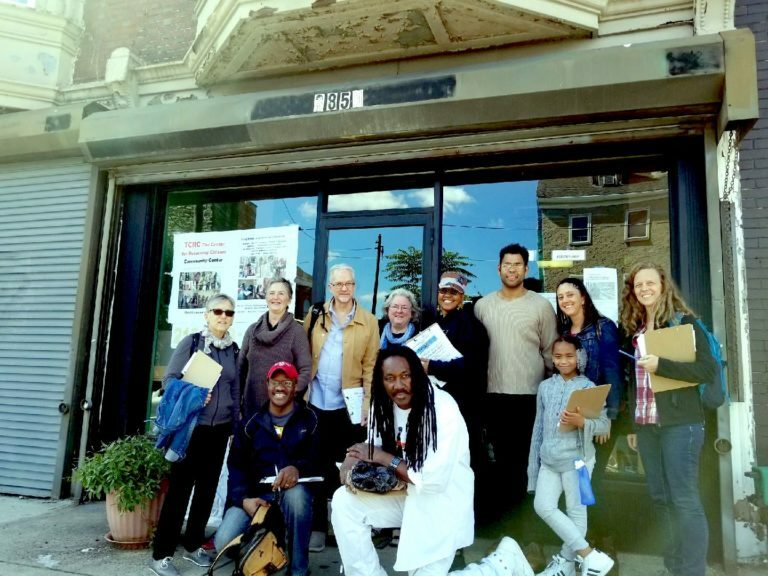 Photo: SCHOOL OF HARD KNOCKS: Members of Water for the Grassroots joined community organizers from Reclaim Philadelphia and the BLOC Party last October to go door-to-door canvassing in advance of local elections. Credit: Donna K. Williams.